Acid Stained Floor Becomes "Talk of Town"
Boutique floor colored with acid stain that was allowed to pool up in order to achieve a mottled look. Only one color of stain, turquoise, was used to achieve all the variations. The owner couldn't be happier with her floor. "It's like walking on water," she says. The countertop was made to look and feel like concrete, despite its vivid color. 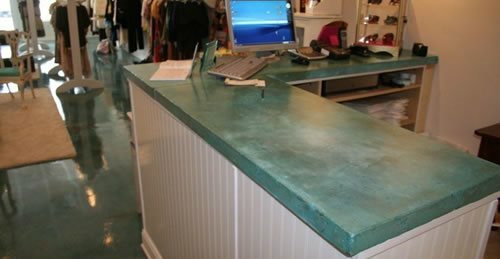 Countertops were also created for the boutique using the same stain as the floor. When passion meets vision, results are always extraordinary. 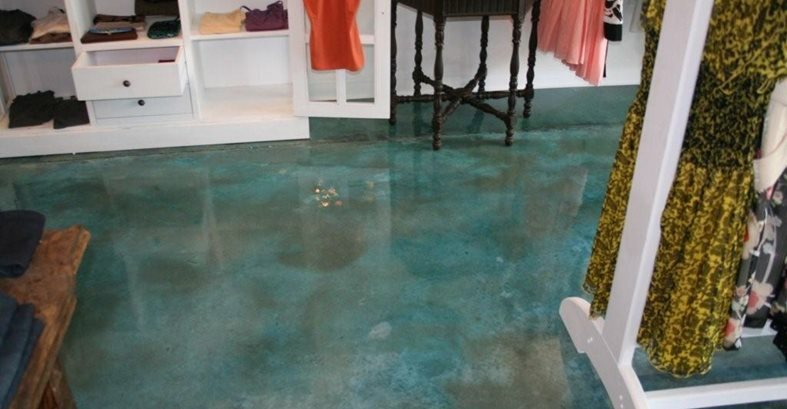 That is just what occurred at the Lula Balou Boutique in Wilmington, NC when Matt Hine, president of Progressive Concrete Coatings, installed a beautiful, aqua-blue stained concrete floor in the contemporary women's clothing store. Hine is passionate about concrete as art, and he relishes the opportunity to create with color. When Lucy Cherry, owner of Lula Balou, said she envisioned a serene and welcoming atmosphere for her boutique, Hine set out to create that mood with color. While working on another job in the same strip mall as the Lula Balou Boutique, Hine decided to approach Cherry to see if she would be interested in an acid stained floor for her store. Although Cherry had already selected another local installer, when she heard Hine's ideas of colors and design she liked his approach better. "I had shopped around and already decided on someone else," she says, "but Matt's work stood out. I liked his samples. He explained the process better and sounded more knowledgeable." 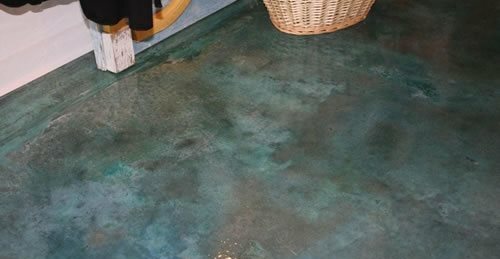 Hine took the time to explain the difference in how he applied concrete stains, and how he could achieve a mottled look. "I was doing another job in the same strip mall as Lucy's boutique when I met her. She had seen other colors and concrete floors, including some she didn't like at all. I had a lot of convincing to do to get her to switch and go with me. But I explained my ideas to her and they coincided with her theme for her store. 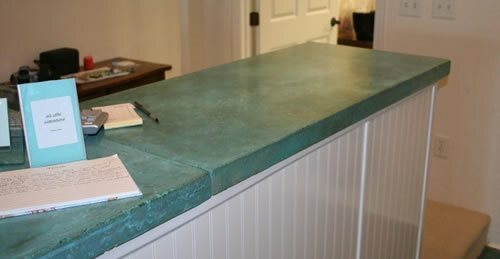 I was also able to offer her concrete countertops, which the competitor could not do." The extra time he spent with Cherry is just one of the many attributes about Progressive Concrete Coatings that numerous customers have come to appreciate. The theme of Cherry's store revolves around the beach and ocean and includes a logo with a mermaid in a clean, teal color. "It was a real, flowy logo on her sign," says Hine. "I told her I could incorporate that aqua color by using a turquoise acid stain that would complement her theme." Hine first cleaned the floor by using a planetary machine with scrub heads and a TSP solution. "You have to be meticulous and get every drop or spec of contaminant in the beginning. If drips of white paint, etc. are left on the concrete, they don't take the stain." For this reason, Hine is incredibly careful about getting the floor clean before proceeding to staining. Hine says, "This is the biggest part of my success with acid stains—prepping right." The 1,000 sq. ft. floor was then stained using a unique spraying technique which Hine describes as key to achieving "a look that is different." Before staining, he always masks the walls, doors, columns, etc. 2' up to keep the stain from coming in contact with anything other than the concrete. The stain is then applied with a sprayer. "To get the mottled look," Hine explains, "I spray a little heavier than normal, creating a wet layer of stain." He also says, "You can't be afraid to have it puddle where the concrete is not completely flat. The stain will naturally puddle giving the floor a richer color in certain areas." 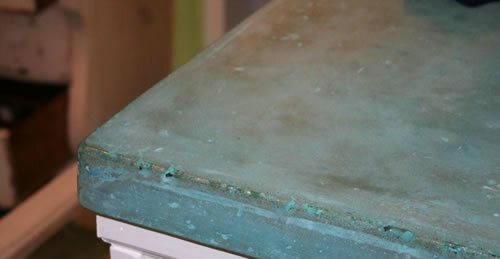 Because of this technique, Hine was able to use just the turquoise acid stain to create a variety of color tones on this project. Hine's biggest challenge wasn't related to the process. It was convincing the owner that the technique would work and the color would complement the theme of her store. "I had to trust him and hope for the best," recalls Cherry. However, in the end, Hine and Cherry were very pleased with the "richness and depth of color." Hine says, "It went along well with the theme and interior design of the store, everything was very cohesive." After seeing the floor, Cherry said with relief, "The color just turned out perfect, it's like walking on water." After staining, the floor was sealed with a two-step process using a 100% solids self-leveling epoxy. First a primer coat was applied and then the floor was finished with the final coat of epoxy. Cherry wanted the countertops to look like natural concrete, or as Hine says, "She wanted to be able to see and feel the concrete." Two things were done to achieve this. First, a slightly relieved edge was created. "We knocked off the edge of the corners with a diamond pad leaving them rough. We didn't want a machine-finished look," explains Hine. Second, the countertop was sealed in a way that wouldn't create the glossy look which results from using epoxies. Hine avoided the unwanted sheen by using a combination of sealer and wax. The countertop was first polished, then sealed, and finally waxed. He describes the final product as "not completely smooth so it looks very natural, and a bit more rustic." The countertops were made using white cement and the same stain that was used for the floor. "We use white cement instead of the usual grey because it gives the color more pop—the acid stain turns out brighter," explains Hine. Hine had no idea how inspiring his creation would become. "Lula Balou is one of my favorite projects...I get a call at least once a month for 'the floor'," he says. Cherry was also pleasantly surprised by people's reaction. "I get at least one person a week commenting on the floor. People say, 'I love your floor, who did it, what's the process?'" Not only was the floor enjoyable for Hine to create and pleasing to his client, but it is also a great testament to the capabilities and characteristics of his business. 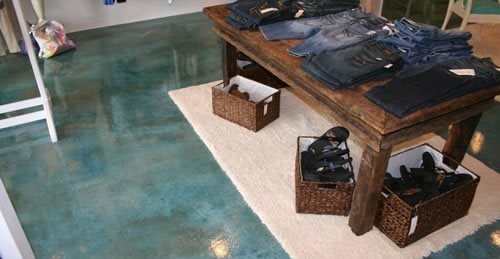 One thing that makes Progressive Concrete Coatings stand out is that they are incredibly detail oriented, especially when it comes to artistic design and finish. 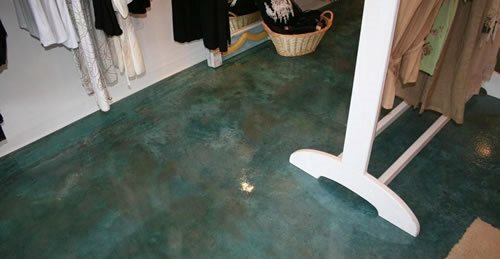 This is extremely evident in the effort and results seen in the stained floor and countertops they created for Lula Balou Boutique. Another great characteristic is that Progressive Concrete Coatings truly puts the customer first, spending as much time as needed with each client. "There is never too little time to listen to a customer's request or to help them find the right color," says Hine. Cherry greatly appreciated this 'customer first' attitude which Hine and his crew exhibited while they worked on her floor. Progressive Concrete Coatings is located in Wilmington, NC and offers a wide variety of decorative concrete applications for new and existing concrete. They specialize in custom acid staining projects. As their website claims, and as Cherry testifies, they are truly capable of creating a "custom look that will be the talk of the town."